Whenever I’m travelling, I always eager to hunt out local beers. It seems odd to fly across oceans to foreign parts, only to seek out something familiar to drink. 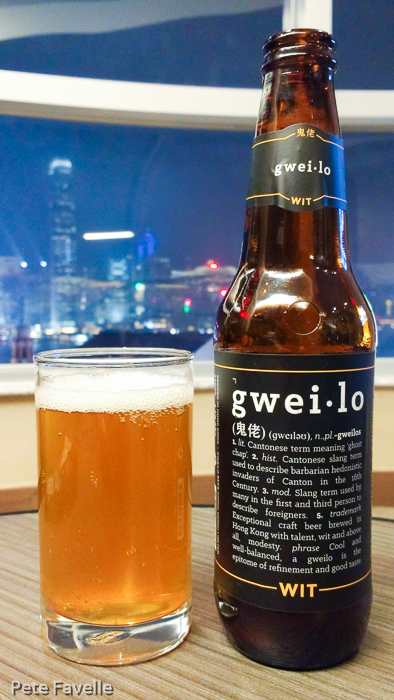 Not, of course, that other countries’ local beers are always unfamiliar; Japan’s national beers – Asahi and, to a lesser extent, Kirin & Sapporo – are readily available (although often in ‘brewed under license’ guise) and the same is true of our latest trip, to Hong Kong. I’ve always quite enjoyed Tsing Tao, and it was nice to be able to drink it almost within sight of its home. 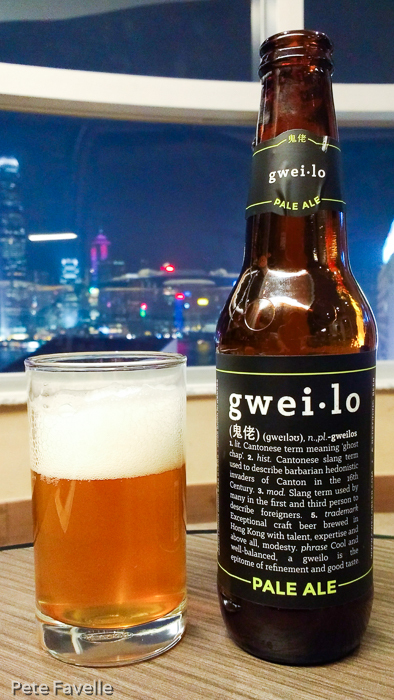 But it would be hard to write much about Tsing Tao, so I went exploring the local supermarkets for something a bit craftier and struck gold with Gweilo Beer. 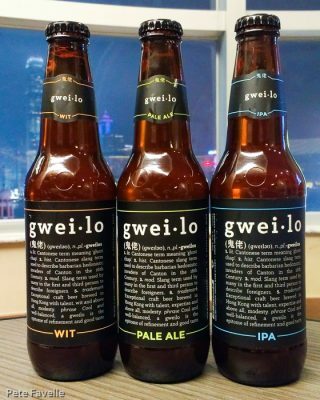 They currently have a fairly limited range, and at first glance I was concerned that this was going to be three bottles of basically the same pale ale with a different coloured label. Happily, I was proved very wrong! Wit is a 4.2% beer with a nice golden colour and a fairly open textured carbonation. There’s a nice but rather subtle spicy aroma, combined with a distinctly metallic character. In the mouth, it’s foamy and initially slightly sugary, but quickly becoming notably dry. The spicy notes are there, but again are rather subdued. I’m not a massive Wit fan to be honest, but this seems to be a pretty decent interpretation of the style. Pale Ale is a 4.5% beer with a very similar colouration and a more pronounced, fluffier head. The aroma is packed full of sweet, citrus blossom hops that is so pronounced that I actually had to double check that I hadn’t picked up the IPA by mistake. Even after checking, I was half-suspecting that there was a labelling error! In the mouth there’s sweet oranges quickly countered by a slightly unruly, powerful resinous bitterness from all those hops. 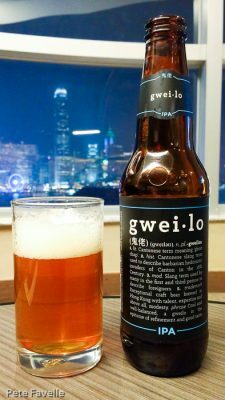 The carbonation is a touch heavy handed, but aside from that it’s a rich, delicious and not at all subtle beer – delicious. IPA is slightly stronger at 4.8%. It’s also slightly darker, although still fairly pale. The aroma is, once again, deeply hoppy but a very different character to the Pale Ale – soft caramels, floral hops and limes. In the mouth there’s an initial gentle toffee which is promptly blown away by sackfuls of deep, bitter hops; drying, with acidic lime and a subtle warmth too. Big, bold and huge – and tasting far above it’s ABV – but lacking the resinous character of the Pale Ale. 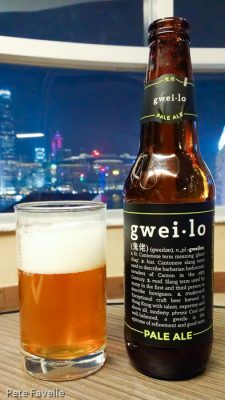 Overall, it’s a strong set of beers – tasty, distinct and well worth seeking out if you happen to be in the right part of the world!